The goal of Surfrider’s Clean Water Program is simple: to reduce ocean pollution so it is safe to surf, swim and recreate in the ocean. Unfortunately, the solutions to pollution are not always so simple. End-of-the-pipe fixes are not enough. Surfrider activists are encouraging their communities to look back towards the land and upstream from their beaches for solutions. Our Clean Water Program advocates for a comprehensive and integrated approach for water and land management which solves downstream pollution problems and supports vital and healthy coastal communities and ecosystems. This philosophy is probably best seen in action in Ventura, California. For the past two decades, the Ventura Chapter has been identifying problems and promoting solutions for clean water throughout the Ventura River watershed. Their proactive urban watershed program is affecting real improvements in water supply protection, water quality, habitat and recreation by taking advantage of all possible opportunities to restore and enhance ecosystem function throughout the watershed. At the top of the watershed they have led the charge to remove the Matilija Dam to restore the natural habitat of the river and replenish area beaches starved for sand. 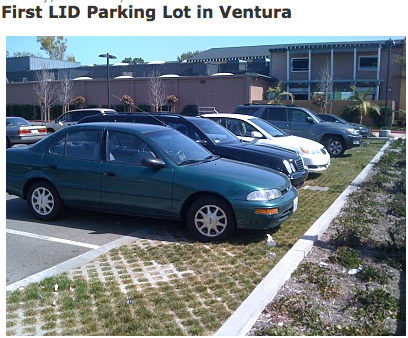 In Ventura’s urban Sanjon watershed, they have advocated for water conservation measures such as greywater re-use and wastewater recycling and the installation of Ocean Friendly Gardens (OFGs) and other Low Impact Development projects such as green streets and permeable parking areas. Surfrider activists are out in the community raising public awareness and advocating for local policies that will take advantage of these opportunities to improve water quality, increase groundwater infiltration and conserve drinking water supplies. Down at the beach, the Chapter has been working with the City of Ventura to implement a managed retreat project at Surfers' Point. This project involves moving an existing bike path and eroded parking lot back, widening the recreational beach area and creating a bio-swale to cleanse and infiltrate runoff from the adjacent parking lot. The parking lot has been redone to allow water to soak into the soil and a small boardwalk has been added to give people a place to enjoy the view without disturbing the restored dune area. 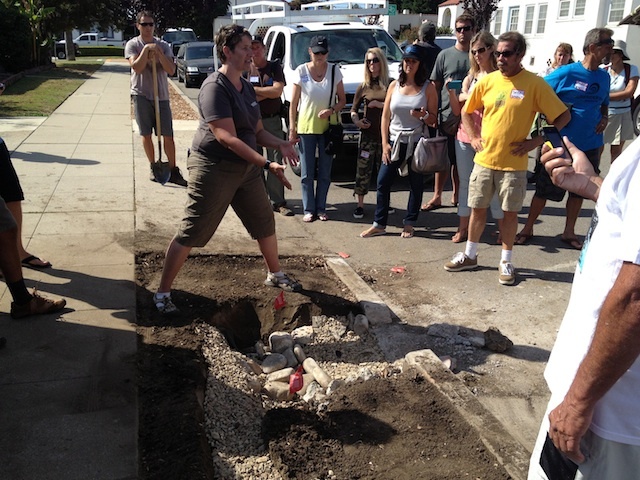 Chapter-run hands-on programs such as Stream Team water quality monitoring and Ocean Friendly Gardens are also providing an opportunity to activate volunteers and to start building restoration projects in homes and neighborhoods. Now in its fifth year, the Chapter’s OFG program has successfully engaged the City of Ventura as a partner. Together they are sponsoring OFG garden series (class, workshop, and workday) and distributing free OFG signs, expanding both the reach and impact of this volunteer-run program. The program is also engaging local landscape professionals: learning at chapter events, leading these events, and implementing OFG principles in their own projects (and posting these to the OFG map). 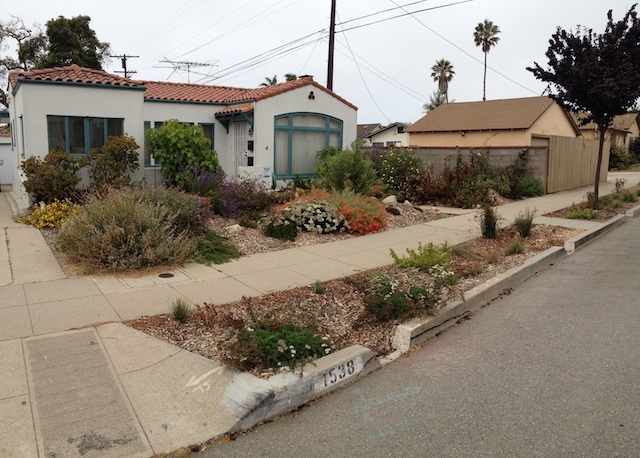 Another great result of this collaboration has been working out the permit details to install curb cuts and co-hosting curb cutting parties, which can extend the water quality benefits of an OFG outside of a single yard to the street. Anyone can pull a permit at City Hall at no cost and without an appointment, just showing a simple design and proof of insurance (homeowners or that of a licensed contractor one uses). Applicants can also use a standard design created by OFG partner, G3/Green Gardens Group, for the first curb cutting project done in the City. The partnerships in the curb cutting project led to OFG-ing a school. 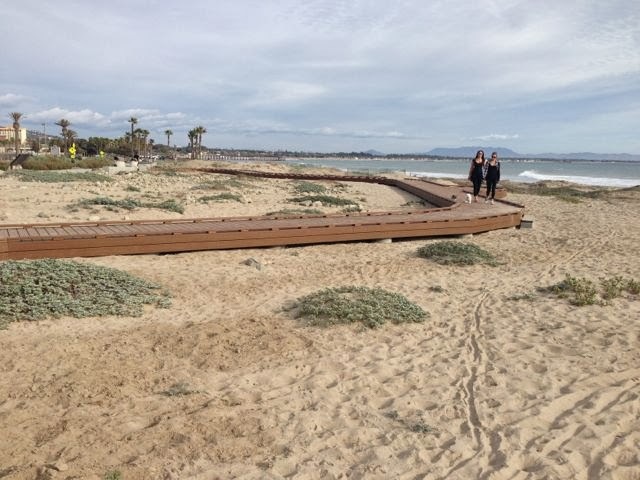 To learn more about these and other clean water and habitat restoration projects in Ventura visit the Chapter’s website or the Ventura River Ecosystem Blog.